When the media and veteran government officials began questioning the true threat posed by the Islamic State, President Barack Obama’s administration concocted a new terrorist threat called the Khorasan Group to scare the American public into supporting airstrikes in Syria, according to Glenn Greenwald and Murtaza Hussain of The Intercept. Many activists and journalists have reaffirmed this allegation, backing-up the assertion that the group is a “wholesale concoction” that was created with a specific purpose by the government. Speaking to RT’s Manila Chan, the ANSWER Coalition’s Brian Becker breaks down the supposed terror network and the necessity of using fear to justify war. October 3, 2014 Posted by mosesman | GeoPolitics	| corruption, Crime, Fraud, genocide, Illuminati, Middle_East, MSM, New_World_Order, propaganda, Psyop, Syria, Terrorism, US, War | Comments Off on Khorasan Group: A Fake Threat Meant to Scare the US into War? Doctor Boards Atlanta Flight In HazMat Suit To Protest “Lying CDC”! “If they’re not lying, they are grossly incompetent,” said Dr. Gil Mobley, a microbiologist and emergency trauma physician from Springfield, Mo. as he checked in and cleared Atlanta airport security wearing a mask, goggles, gloves, boots and a hooded white jumpsuit emblazoned on the back with the words, “CDC is lying!” As The Atlanta Journal-Constitution reports, Mobley says the CDC is “sugar-coating” the risk of the virus spreading in the United States. A Missouri doctor Thursday morning boarded a plane at Atlanta’s Hartsfield-Jackson International Airport dressed in full protection gear to protest what he called mismanagement of the crisis by the federal Centers for Disease Control and Prevention. “If they’re not lying, they are grossly incompetent,” said Mobley, a microbiologist and emergency trauma physician from Springfield, Mo. Mobley said the CDC is “sugar-coating” the risk of the virus spreading in the United States. “For them to say last week that the likelihood of importing an Ebola case was extremely small was a real bad call,” he said. October 3, 2014 Posted by mosesman | Medicine & Health	| Crime, depopulation, genocide, Illuminati, New_World_Order, Pandemic, Terrorism, US, War | Comments Off on Doctor Boards Atlanta Flight In HazMat Suit To Protest “Lying CDC”! A Brief History of Governments Deploying Weaponized Pandemics Against Innocent Populations! (NaturalNews) Throughout the course of human history, governments — even those that claimed to be benevolent — have killed millions of their own people in horrible fashion through the use of what were essentially weapons of mass destruction. A new historical review by Dr. Stefan Riedel, MD, PhD, for Baylor University Medical Center documents some of those uses, but there are other examples as well that Natural News found in its own research. Dr. Riedel’s review was spurred in part by the continuing threat of global terrorism and, in some current conflicts, the use of weapons of mass destruction against civilian populations. But in addition to the standard threats — chemical and conventional weapons – there should be additional concerns about non-traditional, biological threats, and the current deadly Ebola virus outbreak serves as a reminder that pandemics can also be unleashed on populations as a means of decimating them. October 3, 2014 Posted by mosesman | GeoPolitics, History, Medicine & Health	| Africa, Crime, depopulation, Fraud, genocide, Illuminati, New_World_Order, Pandemic, propaganda, Terrorism, US, War | Comments Off on A Brief History of Governments Deploying Weaponized Pandemics Against Innocent Populations! Fallen Angels, Demons & Giants as All Hell Breaks Loose on the Earth! Click on image for 30 September 2014 radio interview MP3 file! If you are unable to download the MP3 file, click here to goto BlogTalkRadio for interview! If you’ve ever read or heard anything about the Illuminati, their bloodlines and the leaders of today, but do not understand (or never heard of) how the giants of Genesis 6, fallen angels and demons fit into this topic, then you really don’t understand the globalist agenda in terms of past, current and planned events or true biblical history. I can assure you that you are not alone, and I personally did not gain this understanding easily or without a significant amount of research and investigation. And… I’m still learning. Understanding the topic of fallen angels, giants, and demons in the context of the bloodline of Adam is the key to unlocking knowledge that few have, and thusly understanding just how far along we are on God’s timeline. Moreover, you cannot separate the biblical topic of giants, demons and fallen angels from current and near-term Geo-political events, although “the illuminated” would certainly prefer that you did. So too would many mega-churches, televangelists, political figures, military leaders, and royalty. The reason? By understanding that the Holy Bible reveals the blueprints of the globalists, including their methods of madness, that the holy Bible is much more than some antiquated or obscure historical reference or even, as some might assert, a collection of fables, you will then better understand the events taking place around us. Events in the recent past will also be seen for what they actually are, and you will then have a better grasp of what lays ahead. You will gain a better understanding of what was actually taking place in the days leading to the flood of Noah’s time, and it might not be what you think. Click on image to goto video! October 3, 2014 Posted by mosesman | EndTimes, GeoPolitics, Social Trends	| Aliens, Bankruptcy, Bible, Collapse, corruption, Crime, Currency, Eurozone, Fascism, FederalReserve, Fraud, genocide, GreatDepression, Hyper-inflation, Illuminati, Martial_Law, Meltdown, Middle_East, MSM, NATO, Nephilim, New_World_Order, Occult, Police_State, propaganda, Psyop, Russia, Satan, Terrorism, UFO, US, War | Comments Off on Fallen Angels, Demons & Giants as All Hell Breaks Loose on the Earth! 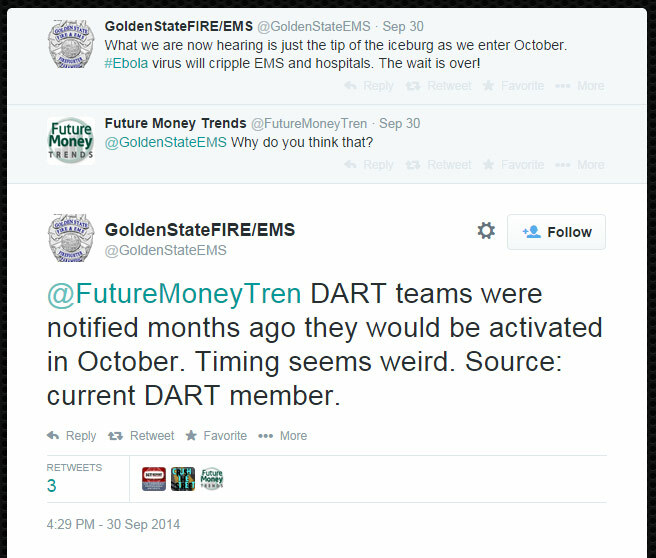 Report: “Disaster Teams Were Notified Months Ago They Would Be Activated in October”!! Click on image for full twitter exchange! American Infrastructure Cannot Support An Ebola Pandemic! Paul Joseph Watson and David Knight discuss the latest Ebola news and break down the possibilities that may occur with Ebola spreading. October 3, 2014 Posted by mosesman | GeoPolitics, Medicine & Health, Social Trends	| Bankruptcy, Collapse, Crime, depopulation, genocide, GreatDepression, Illuminati, Martial_Law, Meltdown, New_World_Order, Pandemic, Police_State, Terrorism, Unrest, US, War | Comments Off on American Infrastructure Cannot Support An Ebola Pandemic! CDC Sweeps Ebola Screw Up Under The Rug! Paul Joseph Watson takes the mic for Alex and covers the latest Ebola news and how the CDC is attempting to cover their tracks with regards to their continued incompetence. Deliberate incompetence is more likely! Who is behind this? The “sons of Belial”, the Satanic bloodlines, seed of the serpent, “the sons of the wicked one”! The arrival of the Satanic capstone, the Anti-Christ, is after a massive genocide, Satanic blood sacrifice of humanity! Top UN Official Talks Of Ebola Doomsday Scenario! Paul Joseph Watson takes the studio for Alex Jones and covers the latest Ebola news, from it possibly going airborne to there now being one hundred possibly infected people. October 3, 2014 Posted by mosesman | EndTimes, GeoPolitics, Medicine & Health	| Crime, depopulation, genocide, Illuminati, New_World_Order, Pandemic, Satan, Terrorism, UN, US, War | Comments Off on Top UN Official Talks Of Ebola Doomsday Scenario! Ebola Unleashed: Bioweapons 101 ! Implied in these statements is that the current Ebola outbreak is ‘unnatural’! Man-made? Click on image to goto website! October 3, 2014 Posted by mosesman | History, Medicine & Health	| Africa, CIA, Crime, Cuba, depopulation, genocide, Illuminati, New_World_Order, Pandemic, Terrorism, US, War | Comments Off on Ebola Unleashed: Bioweapons 101 ! Globalists (Illuminati) Will Use Ebola For Power Grab! Paul Joseph Watson takes the studio for Alex Jones to cover the latest Ebola news and is joined by Alex via cell phone. The Hegelian Dialectic, the favourite methodology of the Illuminati. First, they engineer the Problem (Ebola). Second, the wait for the desired Reaction from the sheeple. And finally, they implement their pre-planned Solution! Problem, Reaction and Solution. Once again the Satanic scumbags who caused the whole problem will present themselves as saviors to the world. The sheeple are too dumb to understand that there is a huge war going on. It is Satan and his minions vs the Rest of Humanity! For humanity to win this war it is quite simple: Repent of your sins and believe on the Lord Jesus Christ, the Blessed Son of God, for forgiveness of sins and salvation. It is that simple! October 3, 2014 Posted by mosesman | GeoPolitics, Medicine & Health	| Crime, depopulation, Fraud, genocide, Illuminati, New_World_Order, Pandemic, propaganda, Satan, Terrorism, US, War | Comments Off on Globalists (Illuminati) Will Use Ebola For Power Grab! Hundreds of airline passengers were exposed to the Liberian national before he landed in Dallas, last month, as it is revealed that he took at least three flights to get from Monrovia, Liberia to Texas. Officials announced that Thomas Eric Duncan flew through Brussels to get to Dallas/Fort Worth International Airport – but no airlines operate a direct flight from the European capital to Dallas, meaning he had to take a connecting flight in between. U.S. officials have refused to release details of his itinerary, including which city he connected through – claiming that none of his fellow passengers are at risk. Several leading U.S. airlines said on Wednesday they were in close contact with federal health officials about Ebola-related travel. October 3, 2014 Posted by mosesman | Medicine & Health	| corruption, Crime, depopulation, Fraud, genocide, Illuminati, New_World_Order, Pandemic, propaganda, Psyop, Terrorism, US | Comments Off on ‘Airborne’ Ebola Info Is Being Removed from Internet! Flight Path of Patient Zero Is Revealed! Obama Admits Plan in Syria Is to Overthrow Assad ! I HAVE BEEN SAYING THIS FOR MONTHS! It’s very clear that the United States’ plan is to remove the ISIS threat and stabilize the country. To say that it will not be done under Assad means only one thing: it is the US government’s plan to remove him from power. The US media obediently ignored this statement, allowing the President to quietly tell the American people that the United States is headed towards another regime change operation followed by a lengthy occupation. This is not a simple statement indicating that the United States will not cooperate with Assad’s government during the war. It is a direct statement showing that the United States is planning to have Assad out before the country is stabilized. It appears Ukraine is on the back burner for now. The western Illuminati has not been able to lure Russia into a European wide war and WW3 using Ukraine. Now, they are attempting to start their Satanic WW3 using Syria again! Professor Kissner: Ebola Outbreak – The Latest U.S. Government Lies. The Risk of Airborne Contagion? Footnote1 Footnote10 Footnote15 Footnote44 Footnote45. Are we to suppose that very recent and ground-breaking research was conducted that indicated there is no longer reason to “strongly suspect” that airborne Ebola contagion occurs? Surely, the research was done three weeks ago, and we only need to wait another couple of days until the study is released for public consumption. Feel better now? If not, perhaps the 9/30 words of the Centers for Disease Control accompanying the Dallas Ebola case will provide some solace. Or, perhaps those words just contain another pack of U.S. Government lies. Let’s investigate. The take-home message is that we now confront a brand spanking new genetic variant of Ebola. Furthermore, we still have no idea at all how the “single introduction of the virus in the human population” of West Africa occurred. And, the current Ebola outbreak appears to be orders of magnitude more contagious than previous outbreaks. It also presents with a fatality count that far exceeds all previous outbreaks combined. But it’s certainly not airborne, so who cares about nit-picking details such as these! October 3, 2014 Posted by mosesman | GeoPolitics, Medicine & Health	| Canada, Crime, depopulation, Fraud, genocide, Illuminati, MSM, New_World_Order, Pandemic, propaganda, Satan, Terrorism, US, War | Comments Off on Professor Kissner: Ebola Outbreak – The Latest U.S. Government Lies. The Risk of Airborne Contagion? News Team: Witnessing Deadly Israel Op in Gaza! October 3, 2014 Posted by mosesman | GeoPolitics, Social Trends	| Apartheid, Crime, ethnic_cleansing, Gaza, genocide, Israel, Nazi, Palestine, Satan, Terrorism, War, Zionism | Comments Off on News Team: Witnessing Deadly Israel Op in Gaza! Americans Shocked Their Govt Owns Ebola Patent! For IN the NOW with Anissa Naouai, The Resident hit the streets of New York City to ask people whether or not they were scared that a known case of Ebola has just been found in Texas. She challenges people on their knowledge of the virus, only to find out that not many Americans know their government has the patent on Ebola, or that it has been sitting on several promising vaccines because no company or government wants to pay for the final stages of FDA approval, remaining clinical trials, and manufacturing of the vaccine. Now that Ebola has reached the states, perhaps people will start paying more attention. October 3, 2014 Posted by mosesman | GeoPolitics, Medicine & Health	| Africa, Crime, depopulation, Fraud, genocide, Illuminati, New_World_Order, Pandemic, propaganda, Satan, Terrorism, US, Vaccine, War | Comments Off on Americans Shocked Their Govt Owns Ebola Patent!